So what do we do, we somewhat car-adverse lovers of the great outdoors? Plan, plan, and plan some more. Do your research. Know what you like and want in a vacation destination. 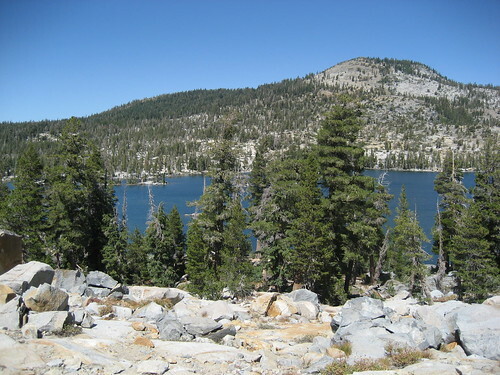 Our recent car-lite trip to Tahoe City went like this. Rental condo in Tahoe Taverns, lake adjacent and just a 15 minute walk from Tahoe City and not along the road, through the condo complex, then through a small state park and the edge of an adjoining condo complex, the back parking lot of a bank – and there you are – at the Truckee River outlet. There is a small health food grocery store just across the street from the condo complex, New Moon Natural Foods, where we could find all the yummy food we needed and are used to. 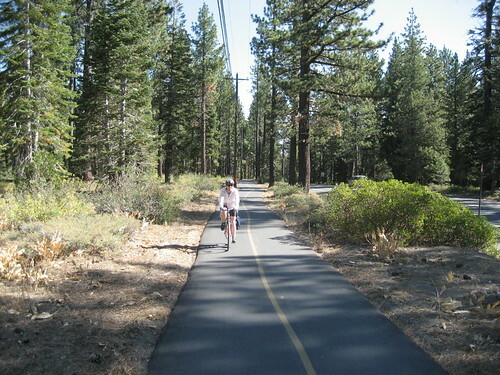 A very walkable and bikeable town, Tahoe City, where they have really done a fabulous job making you feel welcome on foot or by bike. Bike paths that run north and south of town for a total of about 13 miles. You can ride south to Sugar Point State Park on separated bike path almost all the way – there is just one gap where you ride on the shoulder of the road near Homewood for about 3/4 mile. Twice we drove the rental car to trailheads to hike, once we got to Tahoe City we only drove about 60 miles the entire week. Miles driven for our entire vacation were 460. 200 up, 200 back, and 60 while staying in Tahoe City. Miles biked were probably about 75 for me, and 130 for the mountain bike riding husband (Great mountain bike trails within riding distance of the condo we rented – no extra driving to bike.) Miles walked – tough to say since we walk so much, most likely about 40 miles. 20 actual hiking miles – with some serious elevation gains and loses, and 20 casual miles. To town for DVDs, for dinner, to go to the Farmers Market…it adds up. This vacation brought to you by a rental car, 2 bikes, and 2 car lite devotees. Ok, it was really 3 bikes, the mountain bike got squished into the back seat of the rental car, the other 2 were on the rack. And yes, we have our own bike rack even through we don’t own a car. Next post: will we ever get to take the train to Truckee with our bikes? 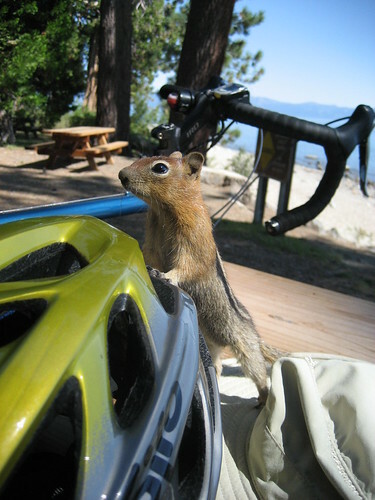 Looks like you had a great time in Tahoe…definitely a great place to bike! Just googled ‘car-lite,’ the name of a site I am designing. My wife and I have lived car-free for almost 14 years, and we started Ottawa’s carsharing company, Vrtucar (now owned solely by our partner). Hi Chris, 14 years car free – congratulations! Car sharing is great, we use City Car Share here in SF and love it. Send the name of your website when you get it up and I’ll add it to the blogroll.